From the Preface: The purpose of this book is to explain the Western's popularity. While the Western itself may seem simple (it isn't quite), an explanation of its popularity cannot be; for the Western, like any myth, stands between individual human consciousness and society. If a myth is popular, it must somehow appeal to or reinforce the individuals who view it by communicating a symbolic meaning to them. This meaning must, in turn, reflect the particular social institutions and attitudes that have created and continue to nourish the myth. Thus, a myth must tell its viewers about themselves and their society. This study, which takes up the question of the Western as an American myth, will lead us into abstract structural theory as well as economic and political history. Mostly, however, it will take us into the movies, the spectacular and not-so-spectacular sagebrush of the cinema. Unlike most works of social science, the data on which my analysis is based is available to all of my readers, either at the local theater or, more likely, on the late, late show. I hope you will take the opportunity, whenever it is offered, to check my findings and test my interpretations; the effort is small and the rewards are many. And if your wife, husband, mother, or child asks you why you are wasting your time staring at Westerns on TV in the middle of the night, tell them firmly—as I often did—that you are doing research in social science. Dr. Will Wright is Professor Emeritus of Sociology at Colorado State University. Before joining the faculty at CSU-P in 1986, he taught at several universities including the University of California, Northwestern University, Wesleyan University, and the University of Arizona. Dr. Wright, who was formerly the chair of the sociology department, has written four major books The Wild West: The Mythical Cowboy and Social Theory, Sage Publications, 2001, Wild Knowledge: Science, Language, and Social Life in a Fragile Environment, University of Minnesota Press, 1992, The Social Logic of Health, (with new Introduction) Wesleyan University Press, 1994, (First edition: Rutgers University Press, 1982), Sixguns and Society: A Structural Study of the Western, University of California Press, 1975. 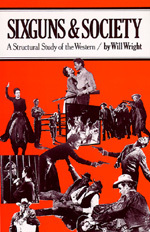 Dr. Wright’s Sixguns and Society is widely considered a classic in its field and despite its publication over 30 years ago remains in print and in the library of every serious student of the Western movie. His work on Westerns is widely cited internationally and his theoretical analysis of the genre is summarized in detail in a number of prominent texts on film and society. Dr. Wright’s scholarly articles on theory, popular culture, and film have appeared in a variety of academic journals including Journal of Popular Film and Television, War, Literature and the Arts, Contemporary Sociology, The Social Text, and New Society. He has also contributed a number of chapters to edited books.